The SBS is a Pneumatic Hammer Corer which has to be driven by an air compressor of at least 2500 lit/min + 8-12 bar depending on water depth. The system consists of a bottom frame and 2 guide posts on which the air hammer with core barrels is mounted. This system is easy to mobilize and operate. The SBS 300 weighs approximately 400 kilograms and has a height of 4 meters. Therefore a small hoisting crane is sufficient to hoist the penetration device over the side of the pontoon or vessel and position it on the bottom. The hammer has a weight of 50 kilograms en beats with a frequency of 1400 hits per minute on the drill tube. 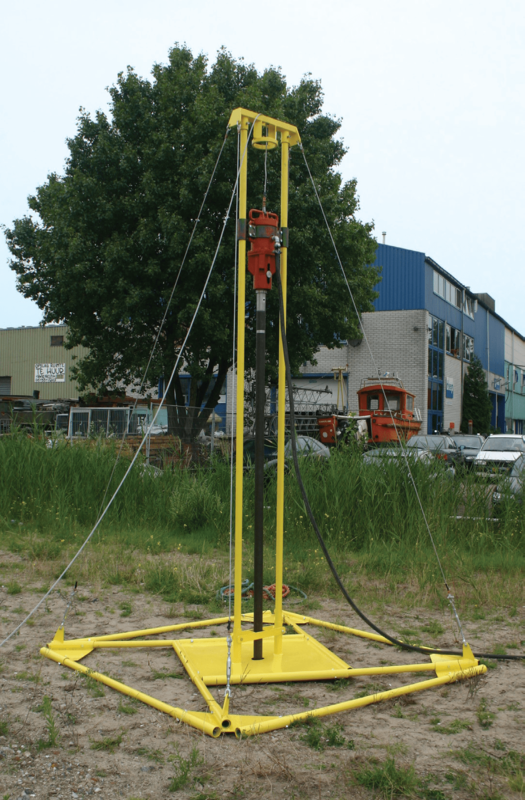 The SBS 300 can acquire a bottom sample of 3 meters long. After the unit is placed on the seafloor, air is fed to the hammer driving the core-barrel containing the PVC core-liner into the seafloor. After recovery the vibration unit and core can be rotated in a horizontal position to facilitate the removal of the liner with the sample. The standard range of vibrocorers includes 3, and 5 meter frames. When the whole system is dismantled it can be easily transported.